The ’98 M3 Sedan has a staggered wheel/tire setup, like the M Coupe and most all other performance BMWs. That is it has wider rear tires and wheels than those in the front. 17×8.5″ vs 17×7.5″ to be exact, with 245mm rear tires vs 225mm front. The result is safe and predictable understeer, not exactly what you want for a high performance car. Some of this can be dialed out with alignment, but the fact remains that you have more contact patch potential in the rear than up front. 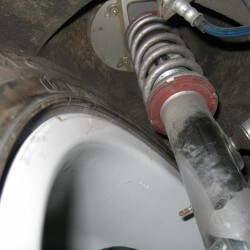 Another disadvantage is that you can’t rotate the wheels, so tire wear is exacerbated. Fortunately there is a rather simple solution to this: run a square setup. As the name implies, a square setup is just having the same size wheel/tire on all four corners of the car. This can get expensive if you are going all out with a complete new set of wheels, but there is a simpler solution. Rather than all new wheels, just obtain two more rear wheels and run them up front. Secondhand OEM wheels, even refurbished ones, are far less expensive than most aftermarket wheels. If you are like me, you also prefer the look of an OEM wheel. I was able to source a pair of refurbished used wheels for only $100 each, seems the market is full of DS-II (Style 39) rear wheels. I actually prefer the look of the DS-I wheels that came on my ’95 M3, but they are only available in 17×7.5″. 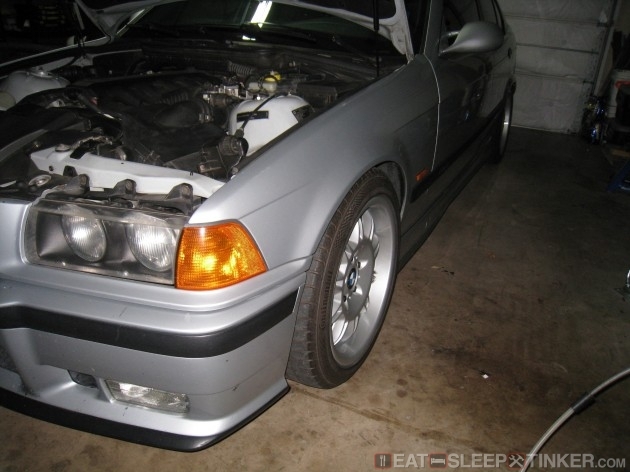 That’s right, BMW used a square setup on the ’95 M3, they switched to a stagger for the ’96 and onward. Guess the American public couldn’t handle the more truly balanced M3 that was first introduced stateside. Now to fit the wider wheels up-front is fairly easy, but will require a spacer. I had a pair of Rogue Engineering 12mm spacers on hand, which provided just the right amount of clearance to the coilover spring. Different coilovers might have different clearance requirements based on their diameter and coil height, but I would consider 12mm the minimum for the TCKlines. The Photo on the right shows the amount of clearance between the inside edge of the tire and lip to the coilover, just enough to be safe I think. Below a quick photo of the car back on its feet in a new pair of shoes. More to come on the driving impressions on the new setup.